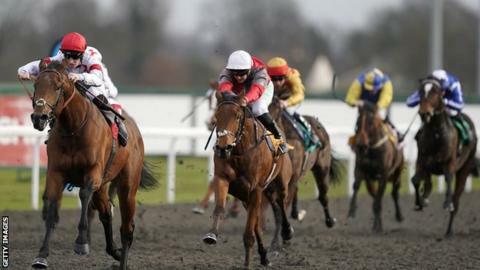 An outbreak of equine flu has led to British horse racing meetings being cancelled and fears over the impact on next month’s Cheltenham Festival. All four fixtures on Thursday were called off by the British Horseracing Authority (BHA) after three vaccinated horses tested positive for the disease. British-trained runners have been barred from running in Ireland. Jump racing’s showpiece four-day Cheltenham Festival is due to start in 33 days, on 12 March. And while it is not known what the precise impact might be, the situation has echoes of the foot-and-mouth crisis 18 years ago, which began at a similar time of year and eventually led to the meeting being called off. Announced late on Wednesday that Thursday’s racing at Huntingdon, in Cambridgeshire; Doncaster (South Yorkshire), Chelmsford (Essex) and Welsh track Ffos Las was cancelled. Wolverhampton Racecourse has said its meeting on Saturday will not take place as a horse from the infected yard ran there this week and a deep clean has been ordered. Racing is not permitted for four days afterwards. They had been vaccinated and are reported to be from the Cheshire stables of Donald McCain, the son of the late Ginger McCain – who trained the legendary Red Rum to win the Grand National a record three times in the 1970s. Horses that have contracted equine flu can develop a high fever, coughing, nasal discharge and sometimes swelling of the lymph nodes. The incubation period is usually days but recovery can take weeks, or even months. There are no known consequences for humans exposed to the disease. The BHA said there was “significant concern over welfare and the potential spread of the disease” and it was attempting to prevent further cases. It said “quarantine and biosecurity measures” are being put in place and horse movements restricted. “The full extent of potential exposure is unknown and we are working quickly to understand as much as we can to assist our decision making,” it added. Since the start of 2019, there have been seven outbreaks of equine flu – in Essex, Cheshire, Derbyshire, Lincolnshire, Yorkshire and Suffolk. The two cases in Suffolk involved thoroughbreds – one centred on eight vaccinated two-year-old horses and the other was six unvaccinated animals. This news has rocked horse racing at a time when anticipation is building before the Cheltenham Festival, and the bloodstock industry prepares for the start of the breeding season. “As you can imagine, a normal race meeting will have circa 70-100 racehorses stabled in a close proximity from all parts of the country, all housed together for a day and then they all go back home to their own yard, so it could be catastrophic,” trainer Seamus Mullins told BBC Radio 5 live. It is unclear at this stage the potential effect on future fixtures with the ‘Super Saturday’ meeting at Newbury in Berkshire on 9 February – where last year’s Gold Cup winner Native River is due to run – the next high-profile fixture. With just over four weeks left to the Festival, the countdown is on for jockeys, trainers, owners and punters, with many leading contenders earmarked for prep races over the next 10 days. Equine influenza is a highly infectious disease that affects horses, mules and donkeys, occurring globally caused by strains of the Influenza A virus. It is the most potentially damaging of the respiratory viruses that occur in UK horses and disease symptoms in non-immune animals include high fever, coughing and nasal discharge. The outbreak at the infected yard follows the identification of a number of equine influenza cases across Europe and the UK, including several in vaccinated horses. Following the recent outbreaks, guidance was sent to racehorse trainers to inform them that all horses that have not had a vaccination against equine flu within the last six months should receive a booster vaccination, and that trainers should be extra-vigilant. However, equine influenza can be highly contagious and – unlike other infectious diseases – can be airborne over reasonable distances as well as be transmitted indirectly, including via people. “It’s very similar to human flu; the symptoms are the same and the horses feel the same,” said Mullins. There is such a feeling of deja vu here, 18 years almost to the day since I recall being at Wincanton races when news first emerged of the outbreak of foot and mouth disease in the UK in 2001. Racing was stopped for a while, and eventually the Cheltenham Festival was called off altogether. There’s no suggestion that this incident will cause the same kind of disruption, but that said there’s big element of uncertainty about what happens next, and any further shut-down – Cheltenham is again looming – would clearly have a considerable effect on the sport but on all the ancillary industries that go with it.